Weekend mornings are special, a chance to take my time making breakfast. Sometimes, though, I don’t want to linger over the cooking. I want a special breakfast made quickly so that I can sit sipping coffee. 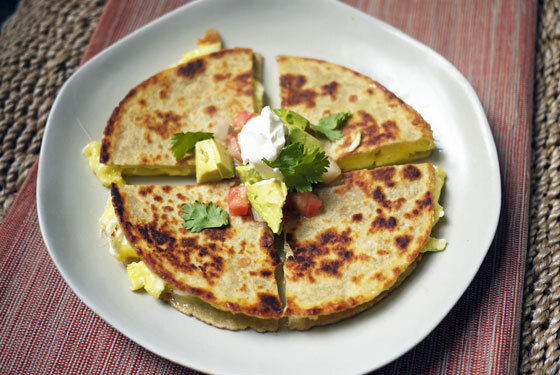 On those weekend mornings, these Breakfast Quesadillas are the answer. These still feel special—they are quesadillas, after all!—but they don’t require the kind of attention that pancakes and waffles do. You simply scramble eggs, stuff them in between tortillas with cheese and fry them until the cheese melts. I love that you can use whatever you have on hand to dress these up or down. I once used sliced deli cheese since it was all we had in the fridge. It worked great! If you have leftover veggies or beans, throw them in. If not, plain and simple is good, too. Top with salsa, hunks of avocado and sour cream (or plain Greek-style yogurt) and serve. Put hot sauce on the table if you’re spicy. However you serve these quesadillas, they are a perfect break from the speedy hard-boiled egg, toast and oatmeal routine of Monday-Friday. Maybe even on the weekdays! 1. Over medium heat, melt enough butter to coat the bottom of a medium frying pan well. In the meantime, crack eggs into a mixing bowl and whisk. When butter is hot, add eggs and scramble as desired. 2. Remove pan from heat and set aside. Lay out ½ of the tortillas and top each with a little bit of cheese, about ½ of what you expect to put in each quesadilla. Scoop eggs onto the cheese topped tortillas, dividing evenly. Top the eggs with remaining cheese and then close with remaining tortillas. 3. Wipe out the pan and melt more butter over medium heat coating the bottom of the pan. Once butter is hot, add 1 or 2 quesadillas—however many fit without crowding—and cook for about 2 minutes, until golden brown on one side. Flip and cook the other side another 2 minutes or so. Once both sides have browned and cheese is melted, the quesadilla is done. Cut into quarters or eights and serve with your choice of toppings.